Onondaga Spring, natural entrance to Onondaga Cave. Where Are Some Springs Worth Visiting? The short answer is: nearly everywhere in the southern two-thirds of Missouri. At this time, there are about 3600 springs large enough to be noticed, and locations marked. In addition to the springs listed in the Top Twenty Ozark Springs list, many state parks, districts of the Mark Twain National Forest and some city parks (especially in cities with the word "spring" in their name) feature springs among their natural assets. The Ozark National Scenic Riverways, a corridor national park along the Current and Jacks Fork Rivers in south central Missouri is replete with springs of all sizes, shapes, and varieties (around 58 to be exact). The Eleven Point National Scenic River in Oregon County also features many springs--there are many more private inholdings along this river than in the national park, so consult a map, and respect landowner's rights to their privacy. 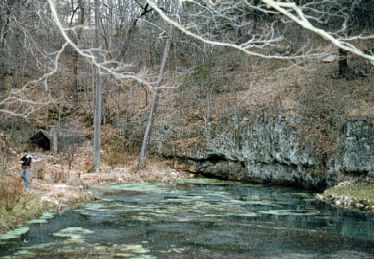 Many caves have springs associated with them, like Onondaga Spring, the natural entrance to Onondaga Cave, pictured above. The booklist For More Information also gives some good leads. Springs are often marked on topographic maps as well--just be sure you know where you are going, and ASK PERMISSION before venturing on private land. Some landowners don't mind courteous visitors, others refuse all requests, and some in the more remote areas still believe a proper Ozark greeting involves guns and dogs. Play it safe--always ask with a smile if you are unsure of your right to view a particular spring. Part of the fun of visiting and studying springs are those which you happen upon in your travels. Not much work has been done on Ozark springs, and there is still plenty to discover for yourself. Good luck, and have fun!